Tolerance is a hot topic in religious circles these days. The world that we live in often seems to cry for tolerance. In doing some research for this article I visited some websites that are all about religious tolerance. One site seemed to pride itself in the fact that there seemed to be one representative from almost every religious affiliation including atheist, Buddhist, Wiccans … etc. I read over their belief statements and it was a hodgepodge of meaningless sentences about nothing. Basically, a belief that we are all valuable or worth something was the teaching. Now please don’t hear me wrong, I am not saying that being tolerant isn’t valuable and worthwhile at times. We don’t need to cause divisions within people simply over debatable religious traditions. It is important to note that if we are true to the Bible, there are teachings that are clearly intolerant. The one that comes out loud and clear in this area is Jesus’ own words in the last verse I have listed in this article. Prayerfully read through these verses. 2 Timothy 4:1-2 I charge you in the presence of God and of Christ Jesus, who is to judge the living and the dead, and by his appearing and his kingdom: preach the word; be ready in season and out of season; reprove, rebuke, and exhort, with complete patience and teaching. Revelation 2:2 I know your works, your toil and your patient endurance, and how you cannot bear with those who are evil, but have tested those who call themselves apostles and are not, and found them to be false. 1 Corinthians 6:1-4 When one of you has a grievance against another, does he dare go to law before the unrighteous instead of the saints? Or do you not know that the saints will judge the world? And if the world is to be judged by you, are you incompetent to try trivial cases? Do you not know that we are to judge angels? How much more, then, matters pertaining to this life! So if you have such cases, why do you lay them before those who have no standing in the church? 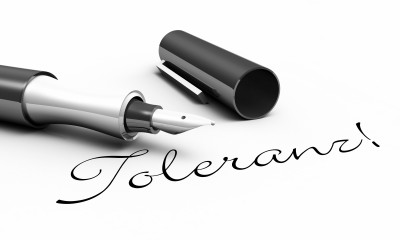 It is important to note that if we are true to the Bible, there are teachings that are clearly intolerant. 1 Peter 3:8-11 Finally, all of you, have unity of mind, sympathy, brotherly love, a tender heart, and a humble mind. Do not repay evil for evil or reviling for reviling, but on the contrary, bless, for to this you were called, that you may obtain a blessing. For “Whoever desires to love life and see good days, let him keep his tongue from evil and his lips from speaking deceit; let him turn away from evil and do good; let him seek peace and pursue it. Amos 3:3 Do two walk together, unless they have agreed to meet? Luke 9:52-56 And he sent messengers ahead of him, who went and entered a village of the Samaritans, to make preparations for him. But the people did not receive him, because his face was set toward Jerusalem. And when his disciples James and John saw it, they said, “Lord, do you want us to tell fire to come down from heaven and consume them?” But he turned and rebuked them. And they went on to another village. 2 John 10-11 If anyone comes to you and does not bring this teaching, do not receive him into your house or give him any greeting, for whoever greets him takes part in his wicked works. The highlighted verse above is so important in this discussion. Jesus is saying that there is no other way to God (and therefore heaven) accept through Jesus. There is no wiggle room here. If we are open to tolerance in this verse then we are teaching against Jesus Himself. I need to say that again, Jesus is saying that there is no other way to God other than through Him (Jesus). Not by being good. Not by believing in Muhammad. Not by going to church. Jesus alone. That doesn’t mean we need to be intolerant in areas of the Bible that are not specifically clear. Some draw divisions over end times discussions. Other draw divisions over the mode of baptism. Other divisions come over the way we need to evangelize. My point is that I believe that far too often within Bible believing churches, we (the church) have become the chords of disunity where none need to exist. The Bible shows that we need to show the love and unity to a lost and hurting world. It is important to study the Scripture and seek diligently for what it says, however we all need to be humble when we approach the words of God and to err on the side of love and unity whenever possible without disregarding the clear teaching of God’s word. Praise Him! How tolerant should a Christian be? just wanted to say how great this site is. I love the music and they way it talks so much sense to me. Im am a christian and latley Iv been having some doubts about my lack of faith to which some other Christians have been commented on in the church, my confidence dropped to an all time low as I have always believed that im quite settled in my faith and know exacly what god id doing in my life but became abit unsettled and started to question it because my interpretation of my religion is a guide to life and god helps my though it. Apart from being a christian.. im also a singer/songwriter, Iv always had a passion for music and god has really blessed my career. when I first started doing the music I found that it was very difficult, as most of the people im surrounded by in the main stream industry arnt usually Christians so I did my best to separate that, and my church friends have tended to judge/ question that my music isnt for god… after having a chat with my good friend, jenny (also a christian) she told me that the world and god work together and the music abilities I have received are gifts from god however you look at it because they bring joy and happiness to peoples lives from all back grounds.. and no other christian has the right to judge me because they also will be judged. Great article! Patience and Love is what the Word says we need, however we are not called to tolerate what goes against the teachings of the Bible; that would be compromising with this world. Absolutely on the mark, Daryl. This truly is an important subject right now inside, and outside, the church. You made some very important points that I hope everyone will take to heart. God bless you. What I took to heart in this article was the verses of love, tolerance, and so many verses you did not include. I believe in the teachings of Jesus as much as the next guy, this is why I say that I think tolerance is exactly what Jesus is aiming for. YES, he says he is the only way, but does he say that he is talking about right here on Earth? Jesus transforms Jewish law, He gives us many teachings but two that stand out on their own. One being the Shema, and he talks about that being the ABSOLUTE law (more important that anything), and right underneath that, the second most important (second being key), is love your neighbor. That is a loud statement for every so called Christian in this world. Now I believe in Jesus Christ, but I only was exposed to this because of how I grew up. If you grew up knowing something, and having every single person you know believe this item of information, you would be set in stone. You would not tolerate people trying to change something that is at your core. And I feel the same way for those of other religions that are being attacked by a speckle of radical Christians that spew hell and damnation because they think that you cannot tolerate those who do not believe what you believe. Daryl, I love the verses you admitted in this article, and I do believe whole heartedly that Jesus is the only way. However, if you try to change culture to replicate a single group of people, you no longer have culture. Can you please explain Mark 12-14 to me? I love figs, but now I fear it is a sin to eat them. Is it because Adam wore a fig leaf? And in Leviticus 19 19, it says not to wear mixed fabric! But I have leather and wool on my new coat, and who knows what else. I’m afraid I am sinning, but I am trying to take the word of the Lord literally. We are meant to, right? And then, in Exodus 21:20-21, it says we can beat our slaves! Well, that’s a relief, at least. The verses you are quoting are written to the nation of Israel, not to believers. Figs are not cursed. Jesus declared all foods clean (Mark 7:19). I would find a good Bible study and Sunday school and bring these things up or ask your pastor. You are taking text and trying to apply it out of context and that creates a false pretext. Okay? “What Christians Want to Know” prepare and distribute very good and interesting Scriptural verses in short summary. I read and attempt to teach others for the last 6 years. so continue, may God bless you more. I have surely learnt something. Can I get more verses about clean and unclean food?